Recent studies shed light on foliar nutrient and irrigation practices. Most citrus growers are well aware that citrus greening (HLB) is one of the most devastating citrus diseases in many parts of the world. The disease is widespread in Florida, Texas, Brazil, Mexico and other major production areas, causing significant concerns about the economic viability of these citrus industries. Leaf chlorosis develops as a result of infection by Candidatus Liberibacter asiaticus (CLas). Interveinal chlorosis of young leaves, similar in symptomology to manganese (Mn) and zinc (Zn) deficiencies that develop early in the growing season, is followed by amorphous mottling of older leaves, which develop later in the growing season. Nutrient deficiency-like symptoms develop in HLB-affected trees, including potassium (K), phosphorus (P), magnesium (Mg), calcium (Ca), Mn, Zn and iron (Fe). HLB causes fibrous roots to decline within a few months after infection and before foliar symptoms develop. Fibrous roots are responsible for the bulk of nutrient uptake; their decline likely explains the deficiency symptoms that develop in the canopy. Research has demonstrated that HLB symptoms can be reduced by foliar applications of micronutrients, especially Mg, Mn, Zn and boron (B). These responses have promoted development and use of enhanced foliar nutritional programs in Florida. Efficacy of these programs has been a topic of considerable discussion and debate. Fertilization programs have varied considerably among growers, and have consisted of various rates and application schedules of essential macronutrients and micronutrients. Water is a limiting factor in Florida citrus production during the majority of the year because of the low water-holding capacity and low organic-matter content of the sandy soils. Evapotranspiration (ET) is the combination of water lost by plant transpiration and removal of water from soils and wet surfaces by evaporation. ET is a dominating factor in the water use for agricultural production systems. Therefore, ET plays a critical role in agricultural irrigation management. Irrigation strategies must be documented and practiced that allow growers to maintain or increase crop production without depletion of water resources. Increases in water-use efficiency are achieved by selecting a proper irrigation scheduling method and application timing. Recently, water management districts in Florida have been concerned that some citrus growers are exceeding their yearly permitted water allocations. Accurate estimation of citrus water use could improve irrigation management of HLB-affected citrus trees. Improved water use would result in conserving water and reduced loss of nutrients from excess irrigation. Current University of Florida/Institute of Food and Agricultural Sciences (UF/IFAS) citrus irrigation recommendations estimate water requirements for mature trees using data collected prior to introduction of CLas into Florida. In the second year of an irrigation study, fruit drop was reduced when trees were watered on a daily basis. A 5-year study of foliar applications of Mn, Zn and B on 5- to 7-year-old Valencia on Swingle trees was recently concluded in a commercial grove. The goal was to determine the effect of improved leaf nutrient status on canopy density and yield volume. This approach has provided the citrus industry with new information regarding fertilization practices to support continued production of existing citrus groves affected by HLB. However, foliar nutrition applications are not likely to lead to past production levels in the short term. The study began in 2010, and trees were 83 percent HLB positive. At the end of the study, in 2015, 100 percent of the trees were HLB positive. The trees selected for this study were evaluated in 2010 and 2011 for extent of HLB symptoms, with 1 = no symptoms and 5 = dead. The average rating (2.5) demonstrated intermediate symptoms that were uniform across trees (rating range = 2.0 to 3.0). Symptoms included interveinal chlorosis of young leaves, chlorotic mottling of older leaves, moderate leaf drop and some stem dieback. Despite some essential nutrients being low in the leaves, the non-treated control trees continued to increase in canopy volume and yield during the course of the study. The first analysis conducted was to determine whether the foliar application of potassium nitrate (KNO3) affected foliar concentrations of nitrogen (N) and K, and growth and productivity of the trees. The lack of an increase in foliar N after application indicated dilution as N moves out of mature leaves to new growth. Unlike leaf N, foliar K concentration of trees receiving KNO3, which was below the optimum range prior to foliar application, was within the optimum range after KNO3 application. The application of KNO3 increased canopy volume compared to the controls. However, yields for KNO3-treated trees were not significantly greater than yields for the controls. One interesting result of this study was that the amount of Mn and Zn taken up into the leaf was not affected by KNO3, as some have speculated. The tree nutrients Mn, Zn and B were applied to separate trees at three rates in addition to non-sprayed controls. The three rates were 0.5, 1 and 2 times the current UF/IFAS foliar recommendations. The nutrient sprays were applied three times per year following flushes in March, May and September. Thus, the rates resulted in a total of 1.5, 3 and 6 times the UF/IFAS recommendations on an annual basis. For example, the UF/IFAS recommendation for Mn and Zn is 5 pounds metallic per acre per year. So trees receiving 3 times the UF/IFAS recommendation would receive 15 pounds metallic per acre per year. The highest rates of Mn and Zn application had the greatest increase in those foliar nutrients. Increase in leaf Mn and Zn concentration right after application disappeared, such that there was no difference found compared with controls prior to the next foliar application. Mn and Zn are mobile in plants. Thus, it would be expected that these nutrients would move out of leaves to growing points. Canopy volume increased with increased application of Mn and Zn, but not B. Yield increased with the 1.5 and 3 annual rates of Mn and Zn, but were lower for the 6 rate compared with the 3 rate. These results indicate increased growth of trees proportional to Mn and Zn within the range tested, but reduced yield at the highest rate. Reduced yield at high rates of nutrients is common because excess nutrients result in increased growth at the expense of yield and could partially explain variability in tree response to nutrient applications by citrus growers. Three studies were conducted in Florida from 2011 to 2015 with the following objectives: 1) determining the effectiveness of ET-based irrigation scheduling on HLB-affected citrus trees, 2) learning irrigation requirements of HLB-affected citrus trees compared with healthy trees and 3) understanding the effect of scheduling on productivity of citrus trees affected with HLB. Conclusions of the first study indicate water use with sensors and ET-based models reduced average monthly water use by approximately 14 percent from the conventional irrigation practice without reducing yields. Results of a second trial using greenhouse lysimeters indicated that healthy trees consumed approximately 25 percent more water than HLB-affected trees. Reduced water uptake by HLB-affected trees resulted in significantly greater average soil water content. The relationship between leaf area and water uptake indicated that diseased trees with thinning canopy density and corresponding lower leaf area took up less water and thus less nutrients from the soil, resulting in potentially thinner canopies. These results would indicate that irrigation amounts would depend on canopy density, and elevated average soil water content may partially explain elevated Phytophthora infection of HLB-affected trees. The third experiment was conducted in three commercial groves on Ridge and Flatwoods soils. Irrigation schedules consisted of the current UF/IFAS, ET-based recommendation, daily irrigation, and an intermediate schedule — all using approximately the same water on an annual basis. The UF/IFAS schedule was determined weekly using the Citrus Irrigation Scheduler found on the Florida Automated Weather Network website (http://fawn.ifas.ufl.edu/tools/irrigation/citrus/scheduler/) and resulted in irrigation as infrequently as every 10 to 14 days in the winter and as frequently as daily in May. Daily irrigation schedules were determined by dividing the UF/IFAS irrigation duration by the number of days between irrigations. The intermediate schedule was about half the UF/IFAS interval for about half the time. Daily irrigation increased tree water uptake and average soil water content. Daily and intermediate irrigation increased canopy density as measured by leaf area index. Fruit drop per square foot of under-canopy area was lower for daily irrigation schedules in the second year of the study, but yields were similar among all irrigation schedules. Leaf nutrient concentrations should be tested annually or more frequently to determine tree status. 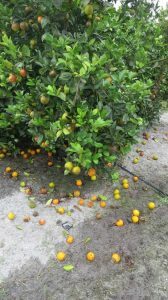 Application of foliar nutrients is critical to maintain the health of HLB-affected citrus trees, but excess application of nutrients must be avoided. Furthermore, it is the opinion of the authors that current UF/IFAS recommendations must be revised to encourage more frequent irrigation with appropriate amounts of water to avoid wet soils. However, the water management districts should not reduce water allocations to citrus groves because the current amounts of water will be required as HLB-tolerant or resistant scions and rootstocks promote improved tree canopy densities. Kelly T. Morgan (conserv@ufl.edu) is a soil and water science professor, and Said Hamido is a soil and water science research associate — both at the Southwest Florida Research and Education Center in Immokalee.